Basic pancakes kicked up a notch and made into the different colors of the rainbow for a fun weekend breakfast! I found a photo of some rainbow pancakes not too long ago and just HAD to make them for the kiddos for breakfast. They were so bright and colorful and just looked fun to make, so I’m bringing them to you. These pancakes aren’t really anything special except that they are fun colors and stacked into a rainbow. I just used the basic box pancake mix for these and then separated them into different bowls and added food coloring to change the color of the batter. 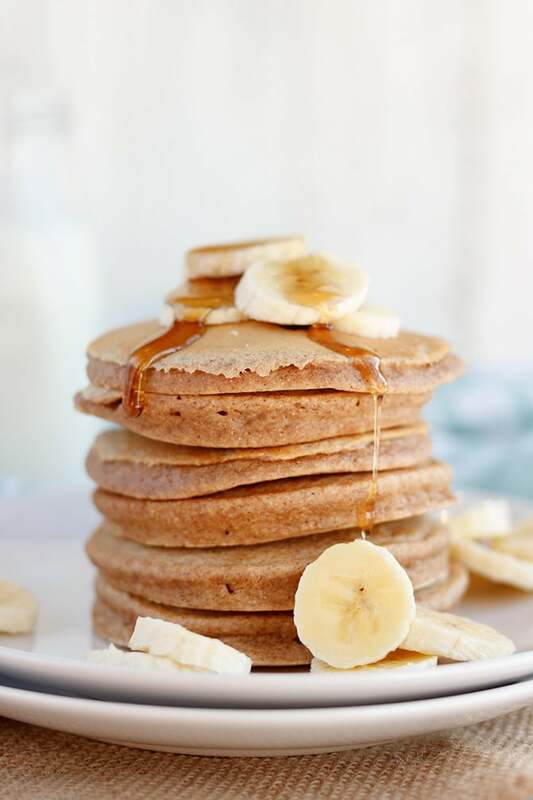 They are great for a quick weekend breakfast when you don’t feel like making pancakes or waffles or whatever from scratch but still want to make something a little special. Plus, who can resist rainbow colored pancakes?! Heat griddle or skillet over medium-high heat or electric griddle to 375°F; grease with non-stick cooking spray. In medium bowl, stir together pancake mix, milk, eggs and vanilla extract until blended. Evenly separate the batter into 6 smaller bowls and add food coloring to get your desired colors. Pour about 1/4 cupfuls onto hot griddle and cook until edges bubbly and edges are slightly done. Turn; cook additional 1-2 minutes and pancakes are done. Stack on serving plates and serve warm. What a great idea, my daughter would love these. It’s amazing what a little color can do to an ordinary day, or ordinary recipe! Our kids love this jazzed up version of their famous breakfast food; as do their dads. Great job with this one!!! These are so fun, I just had to share! What a cute way to jazz up breakfast for the kids! These are absolutely STUNNING! And I’m a little mad that I didn’t see them before St. Patrick’s Day. And also now I want pancakes.